As the last month of spring, the weather in New Zealand becomes notably warmer and (usually more settled) during November. Although there can be cold snaps (particularly in the South Island), most kiwis look forward to November as the start of the warmer weather. Although the ski season is over, it's a great time of the year to be exploring the country. The days are getting longer, and it's pleasantly warm for exploring the outdoors. Despite the excellent weather, it's a quiet month for tourists. Accommodations are plentiful and usually charge low-season rates. New Zealand lies between 37 and 47 degrees south of the Tropic of Capricorn. Remember that everything is the opposite of the northern hemisphere. Winter is warm, and the summer is colder. To put it in perspective, Christmas barbecues on the beach are common. Both the North and South Islands of New Zealand enjoy a moderate, maritime climate. In general, it gets colder the further south you go. Most of New Zealand's landmass is relatively close to the sea and having such a maritime climate means there is an abundance of sunshine and pleasant temperatures throughout most of the year. While the weather is mild, conditions can be changeable throughout the day so preparing for a bit of a chill or a rain shower is a good idea when you are spending time outdoors. In any season, the North Island can receive quite high rainfall, which accounts for the country's lush green environment. Northland and Coromandel have the country's most rainfall, while Auckland averages 12 days of rain in November, Bay of Islands and Rotorua get 11, Christchurch averages seven days, and Queenstown gets nine. New Zealand has the highest incidence of skin cancer in the world. The sun can be rather harsh and burn times are short, especially in the summer. As spring moves into summer, it is essential to apply a high-protection sunblock (SPF 30 or above) during outdoor activities. 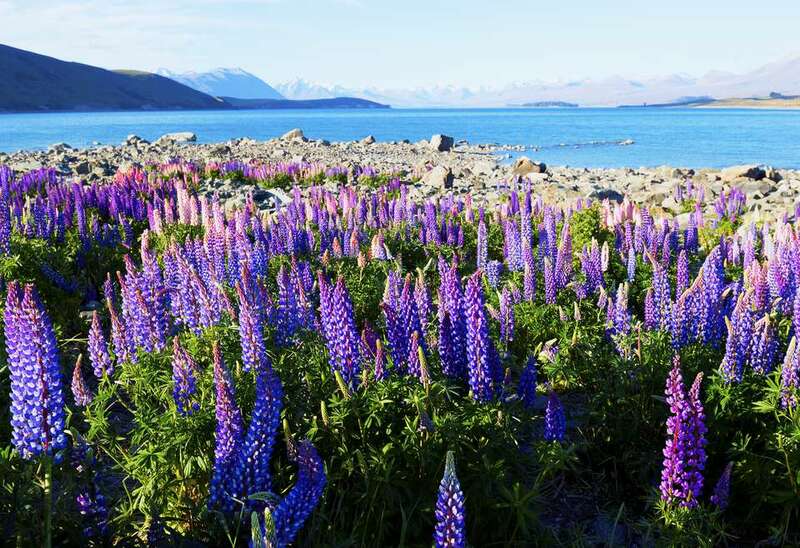 Most people travel to New Zealand to enjoy the natural beauty and outdoor recreation. While skiing is over in November, its a great time for hiking. Packing hiking gear (or at a minimum, walking gear) is essential. A good pair of day hikers can serve you well for sightseeing and light hiking. Layering is essential because of the changeable weather. A fleece vest or under-jacket can be helpful. Prepare for rain and gusts of wind with a light waterproof jacket and hat or umbrella. Clothing that will protect you from the sun is recommended. Sunglasses and sunscreen are essential. Lighter clothing (and a swimsuit) for time relaxing or going to the beach will also be necessary to pack. Remember, November is spring and December is summer. Although many people are beginning to think about preparing for Christmas, the warmer weather brings a greater range of events and activities. Toast Martinborough in Martinborough (North Island) is an annual wine and food festival. Canterbury Agricultural Show in Christchurch is like a state fair in the United States. It's the South Island's largest agricultural event and includes carnival rides, live entertainment, thoroughbred, and standardbred racing, and the New Zealand Cup, one of the oldest races in New Zealand having been run each year since 1865. Southern Traverse Adventure Race (South Island) is an exciting race for teams of three to five serious competitors through New Zealand's toughest terrain. The endurance events cover high ridges, lakes, and river crossings throughout Otago. Hawkes Bay Food and Wine Classic (North Island) is a culinary festival with wine dinners, a beer garden, entertainment, and special dining events. Timaru Festival of Roses (South Island) taking place in late November or early December, this is a summer celebration with public and private garden displays, rose-themed tours, floral art creations, children’s activities, music, and theater. Waiheke Olive and Artisan Food Festival on Waiheke Island (North Island) is a chance to celebrate and sample the new season of Waiheke olive oils, relaxing with jazz, food, and wine in a spectacular garden setting at Waiheke's Rangihoua Estate. It might be counterintuitive coming from somewhere in the middle of winter, but don't forget to hydrate in New Zealand this month. Bring a refillable water bottle. You can drink the tap water in New Zealand, have a water bottle with you to be a more environmentally sustainable traveler. You may consider New Zealand expensive depending on the exchange rate. Since New Zealand is an island country, it is somewhat isolated, and goods have to be shipped in via air or boat. November is often a good time for a bike ride, but bicyclists aren’t allowed on the motorways, and it may be dangerous on roads. Wearing a helmet is mandatory, too. Tipping isn't expected in New Zealand. Reserve tips in restaurants for exceptional service, perhaps 10 percent. Other service industries do not expect tips. New Zealand is very safe. But should you need help in case of emergency, dial 111 to get connected to ambulance services, the fire department, or the police. New Zealand should be on your bucket list for the incredible natural beauty, Maori culture, the mild climate, and the safety factor.